I am aware this is a Business Blog, but like millions of other Indians – I am also a big cricket fan and it would not be prudent, if I don’t write a single article on it. In this on-going Cricket world cup, I do make it a point to read every article, match analysis and opinions made by cricket pundits…And yes, I do have my own theories as well…and that’s why this article! Before the start of the World Cup, Indians were hot favorites to lift the cup – squarely due to the weight Indian batting line-up carries. India has ordinary bowling line-up and even more ordinary fielding. It is a common knowledge that, if you want to lift the world cup, you need to be best in all 3 departments. But even then Indians were tagged as favourites. Now, after all the league matches are over and we are at the knock-out stage, the aura of invincibility around Indian batting line-up is diminished – Thanks to batting collapses. We could not even beat the minnows comprehensively. Apart from Tendulkar, Yuvraj & Zaheer Khan no one seems to be in real good form. For me, South Africa has the best chances to lift the World Cup, Pakistan looks quite strong and so does Sri–Lanka. Australians had a blip against Pakistan, but still they are a very formidable side. This is what the general feeling is amongst the most people following this world cup. So, this time around there 4-5 teams which are Even-Stevens and chances are nearly equal for all of them to lift the World Cup. But there is one community of people who get things right more often than not – because lot of money is riding on their backs and those are – THE BOOKIES ! So, if you want to really know who will win, look at the odds given by the bookies. They have better chances of getting things right than most of the others. 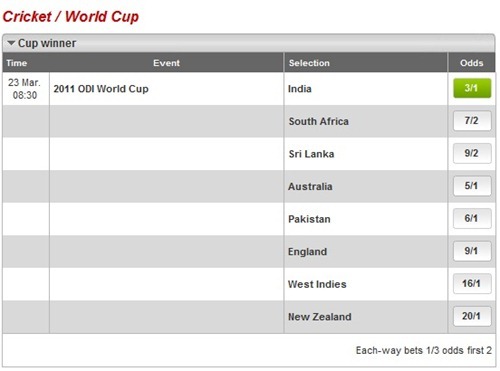 To find out I went to some of the top betting sites on the internet to check out the odds, and to my surprise most of them feel India are still the favourites to win the World Cup. 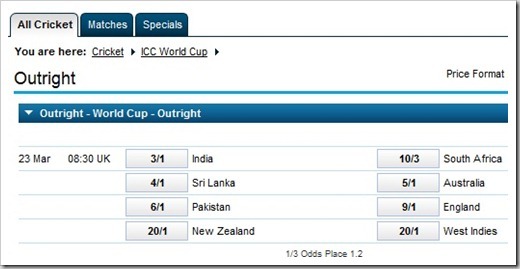 According to William Hill website, India is favorite to win the World Cup with odds of 3/1 and South Africa are close 2nd at 10/3. Another major betting site in the world, Ladbrokes also puts India firm favourites with odds of 3/1 and places South Africa slightly lower than William Hill at 7/2. Bet365.com, which is another popular cricket betting website puts India as second favorites just behind South Africa. Here is my take – If India win against Australia, there are high chances we will witness India Pakistan clash, which according to me would be a dream final. For me, Clash against Australia is the key ! So, what is your take ? Will India make it to Finals and win it ? Atleast most bookies think so…. Spice Popkorn : Value for money projector phone! Anyway buddy, 50% of your prediction was right. Congrats. cricket’s always been a funny game. especially being a south african – you have to laugh otherwise you’re a goner. we learnt in the first world cup, when mr duckworth made his *&&% entry, how to take a good laugh when richardson baseball-style approached the next ball that needed 22 runs. this world cup is dejavu in so many ways, reminiscent of what’s happened before. Inherantly, playing NZ is like playing the all blacks (rugby), which automatically elevates the abilities of anything from NZ – I think it’s something every kid in SA grows up with, and that is a handicap. SA will beat them on form only, and be that just just. If I had to put money on anybody, it would be the english. and I would be more than happy to lose it. but they seem to be the original wildcard. theyve come close to losing and winning to all the major players, and theyve survived this far….as a SA boy, Id rather play sri lanka….which has been the quietest team in the tournament. They’ve gotten on with the job, and delivered. They don’t seem to have heros, like the rest of the teams who have needed to get through, but there’s a team that quietly imposes it’s professional manner, and will win most games. If SA get’s past NZ, and SL, it will take nothing short of a miracle to stop them from bringing the cup to Africa. Thanks for the bookies insight – interesting. Though the heart says India every time, I would rather see the best team win because matches and success are about team and not just one individual star who is in form/ had a lucky day. I agree that SA, Aus and Pak are all strong teams both talent and psychologically – at least it feels that way though India is #2 in ODI ICC rating. Indian bowling is yet to make a strong mark. Indian batting line up though looks great on paper, they frequent collapse leaves us nail biting when India is batting. Aus might win against India, though i wish the opposite would happen. Australia win world cup, 2011, australia and Newzealand will be played final. In the days of Match Fixing, what are the odds of getting the odds correct? QF 1 : Pak Vs WI : Pak will win. QF2 : Ind Vs Aus : No clear cut probability but a slight inclination towards India. QF 3 : NZ Vs S Africa : S Africa will win. SF 1 : SL Vs S Africa : S. Africa will win. SF 2 : India Vs Pak : India will win. Final S Africa Vs India : S Africa will win. As I said above, its purely my view and everybody can have their view. Will be interesting to compare the actual results when they come out..
My disagreement is only on the Finals result…I predict it will be India and South Africa will actually loose quite heavily… Remember India Australia Finals…something like that only !!!!!!! You are on the money… mostly. You got all correct except QF3 and so, SF1. I would totally agree with that guess. But I am so happy with the current SL and IND tie for Finals. I see more chances of India winning this one. I hope they replace Nehra with Ashwin. Thanks For Giving this wonderful information……..